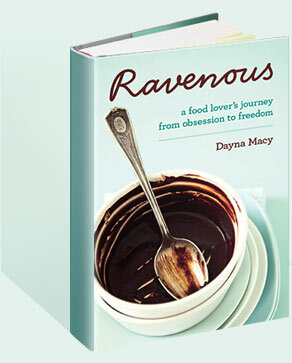 2008 May — Dayna Macy, author of "Ravenous"
At the end of the class, a woman asked how she can take care of herself around food when a) she doesn’t have time to cook and b) she’s not really that interested in food but knows she needs to eat well to be healthy. Bo said there are those that eat to live (like this woman) and those that live to eat (me). I said something like, go to Whole Foods or some other healthy store, buy prepared foods and enjoy them. Amen sister. The woman who asked this seemed to feel superior to the woman who wants to eat well but doesn’t have time or inclination to cook. I am always interested in observing how our egos shore us up in order to make us feel superior than others. And, I agree totally with Bo: just goes to show how much healing needs to be done in this arena. Say what you want, but I believe that if you really need something in your life, the universe delivers. I’ve been thinking, for at least a year now, that I need to begin a meditation practice to augment my yoga practice. My life is pretty busy, and work is sometimes chaotic. It’s always helpful if you can find the calm in the middle of a storm. So when I bumped into my dear friend Jennifer last week and told her how much I wanted to learn to meditate, she asked, “what are you doing later?” Turns out, Jennifer wants to become a meditation teacher. And I became her first student. She came over, and as I fidgeted, checked my watched, (and almost checked my email), she made sure I found a comfortable seated position (for me, it’s a chair). I was impressed by the care she took with this — she takes meditation seriously. And so I told myself to slow down and pay attention to what she had say. She taught me a simple technique in which you count backwards from 50 by twos, with every exhale on the even count. At the count of 20, pause, and then switch to an in/out breath for each count. When you get to one, you then simply sit and breathe. What happened next was surprising and profound. I fell into such a deep state of relaxation, it was almost like falling into another reality. We sat only for ten minutes, but they were a great ten minutes. She asked me to do this every day, and so far, I have. What I’m after is learning to sit with what is, and not hide, turn away, or distract myself (People Magazine anyone?) We can fritter lifetimes away with distraction and I don’t want to fritter mine. I’m off to the Yoga Journal Boston Conference, teaching a class with Bo Forbes on how yoga can help wake you up around what and how you eat. I say teach, but really, I’m there to learn. It’s a Q&A — I’ll do the Q and Bo will do the A. Really? I have rarely ever read such egoistic, delusional spin. Maybe there was a rigorous internal inquiry, but of course, it was after the the Times, the paper of record, had already published many of Blair’s fallacious stories, even after having been warned by his staff members that Blair was making things up. As someone who makes most of my living from public relations, I find his spin remarkable, transparent, and embarrassing. But it is a lesson in human frailty, and the deep desire of the ego to protect the self at all costs. Not the actress and princess. The 15 year old sax player. She’s pretty great. Here’s a video of her playing with guitar virtuoso Russell Malone, holding her own. I’ve been swamped of late, hence the lack of blogging. My family and I went to Sea Ranch two weeks ago, and it was a great joy to see my children jump on boulders as the waves licked the shore. Then, two days ago, one of the three magazines I work for, Backpacker, won the National Magazine Award for General Excellence. That is a pretty big deal, and I had the honor of writing up the winning release. It was a happy moment for all. I’m also working on a bunch of other projects, including the upcoming Yoga Journal Boston Conference, where I am handling the PR, as well as teaching a class with Bo Forbes, a wonderful yoga teacher and therapist, on the Yoga of Food. We’ll hold a discussion about how yoga affects your awareness of your body, and how to bring that into how we nourish ourselves through food. That’s coming up on May 20th in Boston. Only other things to report is that I am still grooving on Burt Bachrach. He makes my heart flutter.